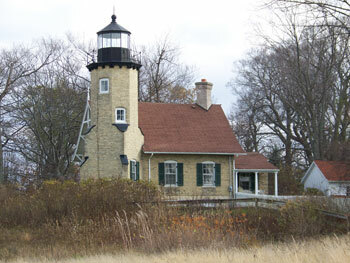 Built in 1875, the White River Light Station is one of four lights operated by Sable Points Lighthouse Keepers Association. Located in Whitehall, Michigan (about 40 minutes south of Ludington), the Light Station is situated between Lake Michigan and White Lake. Take US-31 to White Lake Dr exit. Turn right on South Shore Drive. Turn left and continue following museum signs to the end of Murray Road. Back in the lumbering days, a channel was dug between these two bodies of water to allow schooners to access the sawmills, adjacent to pine forests. Later, passengers arrived from Chicago on steamships to enjoy summer activities on White Lake. White River Light Station's first keeper was Captain William Robinson. He and his wife Sarah and their thirteen children spent 47 years at the Light. Many qualified people followed, including Frances Marshall, the last female lighthouse keeper in Michigan. The light station was decommissioned in 1960 and became a museum in 1970. Here, you can climb the spiral staircase to the top of the tower or view the original Fourth Order Fresnel lens. There is a $5 donation for adults and $2 for children 11 & under to climb the tower.